CounselLink provides nearly instantaneous feedback on the firm’s submitted invoices, confirming approval and calling attention to any billing issues in time for the firm to make the adjustments required to comply with the client’s billing guidelines. Founded in 1997 by four veteran trial lawyers, the law firm, Wood, Smith, Henning & Berman (WSHB), has earned a reputation for combining excellence in trial practice with fair rates and efficient, technology enabled billing and management. WSHB’s diverse practice area expertise includes construction, general liability defense, transportation, product liability, environmental, toxic tort, employment, professional liability and medical malpractice, subrogation, insurance and commercial litigation. In 2015, Law360 recognized WSHB as one of the 250 largest law firms in the U.S. While many law firms aspire to grow, the process is not without its challenges. For Los Angeles law firm, Wood, Smith, Henning & Berman (WSHB), growth over the years has resulted in a significant increase in the number of cases it handles. Not only has their matter volume grown, but in the case of one client, a major U.S. property and casualty insurance carrier, WSHS is bound to submit hundreds of invoices to the client by the 20th of each month. The high volume of invoices and client due date requirements makes it imperative that WSHB have a highly efficient process in place for billing. One of the hallmarks of WSHB’s customer-focused philosophy is striving to work within its clients’ systems. 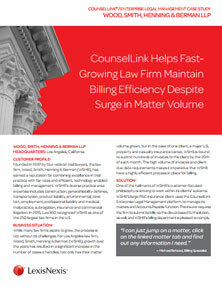 WSHB’s large P&C insurance client uses the CounselLink Enterprise Legal Management platform to manage its matters and Accounts Payable function. The insurer requires the firm to submit its bills via the cloud-based ELM solution, as well, and WSHB’s billing department is pleased to comply.